Perception is everything. As long as people cling to the mistaken belief that they are immune from being scammed they will harbor the notion that victims must deserve their fate. Authorities, like us all, associate mental images to certain crimes. White collar crimes invoke non-threatening images of guys in suits, not thugs in balaclavas. And naturally we treat such individuals with respect and courtesy rather than fear and severity. It appears at times that our justice system does not place adequate emphasis on fraud and other white collar crimes especially when it is considered a non-violent victimless crime. One disturbing fact is how the offense is perceived, not as a criminal offense at all, but as simple bad judgment on the part of victims, by both the general public and by the victims themselves. This perception can lead to a tendency to blame the victims for their own losses. It affects how society sees the victims, and how the victims see themselves. This in turn can influence the way the offense is treated by law-enforcement and regulatory agencies, and when offenders are convicted, by the courts which sentence them. Compared to the murderers, rapists and urban gangsters that get the headlines, white-collar criminals just don’t scare the public very much. They don’t leave a chalk outline on the sidewalk or blood spatter on the wall. So while violent crimes demand a high profile response from the police, the cost of white collar crime is significant but hard to measure in human costs. The price tags attached to some economic crimes are so staggering that they are difficult to comprehend. As an example, the price of bailing out a single corrupt savings and loan institution surpassed the total of all the bank robberies in American history. Recent FBI statistics place the average take of an armed bank robbery at $3,177 while the Data Processing Management Association reports that the average computer crime loss to banks may be as high as $500,000. Adult children are simply stunned to discover their parents have been bilked out of tens of thousands of dollars by personable telemarketers. While few laws are enforced 100%, white collar crime has a much lower margin of non-enforcement. Fraud and other white collar crime is not a priority for police departments. They are required to devote their resources to crimes of violence and, due to lack of trained personnel and financial resources, are not always able to investigate and prosecute suspected fraud and other white collar crime cases. Priorities set for the police by the Government do not cover fraud, so the specialist investigators are often diverted to dealing with other sorts of crime, according to Ken Farrow, head of the City of London Police fraud squad. He said: "There is little or no incentive for local police chiefs to commit already stretched personnel to combating economic crime. The situation is compounded by dwindling numbers of qualified fraud investigators as experienced officers retire and are not replaced." The Serious Fraud Office handles only 80 to 100 of the most serious cases and the Metropolitan Police generally deals only with cases of involving amounts over £750,000, leaving the rest "to under-resourced local police forces. This means many fraud reports go uninvestigated." Mr. Farrow said: "Local police forces cannot deal with all of the fraud reported because they are starved of resources and have to focus on other policing priorities set by the Government - such as violent crime, drugs, car crime and burglary." "There are only 500 to 600 police fraud investigators dedicated to tackling economic crime in the UK. And, at any one time, half of these may have been diverted from fraud cases to deal with other forms of serious crime." A government report has recommended creating a national fraud squad at a start-up cost of £85m, but nothing has happened. Many law-makers and judges are of the mind that, with an already overloaded justice system, jails should be used for violent offenders only, so fraudsters are given what are perceived as lenient sentences, or an absurdly low penalty in comparison to the crime committed, such as alternative sentencing (e.g. warnings, probation etc.) or by "buying their way out" of prison by paying a fine or restitution. A white-collar criminal, now rich off the spoils of others, can afford the best lawyers, and due to their perceived non-violent nature, is often sent to a country club institution for a short period of rest. AARP research indicates that less than 5% of people believe that fraudulent telemarketers are "hardened criminals." White-collar crime, because it requires planning, is a prototypical example of deferrable conduct, but to prevent it through deterrence the punishment must be designed to teach offenders that crime does not pay. Evaluation of rehabilitation programs found that most did not rehabilitate offenders, mainly because changing another’s behavior is difficult especially when that person doesn’t want to change. Police say Canada's slap-on-the-wrist justice for deceptive telemarketing makes it a dream location for unscrupulous operators. And this brand of fraud has become one of the biggest criminal industries in the country, say police and business experts. They estimate there are more than 1,000 misleading operations in Canada, pitching everything from bogus lottery winnings to credit cards to loans. One prominent example cited by many lawyers and police officers involves a groundbreaking 1999 case in which a Toronto-based telemarketing firm —World Media Brokers —was convicted of illegally selling Canadian lottery tickets to Americans. The company was handed an $80,000 fine —small potatoes, says Peter Mueller, an assistant U.S. attorney in Seattle. "They didn't do anything with them." Detective-Inspector Larry Moodie of the OPP, who investigated the World Media Brokers case, shares that frustration. "An $80,000 fine is nothing. It's less than a day's income for these guys," he says. "As a police officer, I'd like to see them go to jail, but in Canada that's rare for a crime that doesn't involve violence. It makes us look bad." The justice handed out to World Media Brokers is typical of the kind of sentences deceptive telemarketers receive in Canada, police say. In addition, the pace of Canadian justice in dealing with telemarketing fraud is snail-like. Forty-two Toronto boiler rooms have been shut down since February, 2000 by the Toronto Strategic Partnership, a project involving Toronto police, the OPP, the provincial government, the Competition Bureau, the U.S. Federal Trade Commission and the U.S. Postal Inspection Service. Yet, more than two years later, the 134 charges laid in those cases have yet to make their way through the courts, says Rob Dowler, a director with Ontario's Ministry of Consumer and Business Services. The ministry has won nearly 70 convictions since 1994 under the Loan Brokers Act, designed to protect consumers from telemarketers offering up-front-fee loans. The courts have levied just over $1 million in fines in those cases and handed out a total of 31 months of jail time —a collective punishment lighter than sentences routinely levelled against lone offenders in the U.S.
By contrast, Toronto telemarketer Walter Fantin, who faced American justice in a Buffalo court, was sentenced in March to nearly five years in prison and ordered to repay $8.9 million (U.S.) he took from investors in a massive fraud scheme. Assistant U.S. attorney Mueller has tried two major cases involving Canadian telemarketing firms and he says American justice officials perceive Canadian courts as "soft" on this crime. "The Canadian legal system is unwieldy," he says. "It doesn't respond well. Judges are lazy; prosecutors ... put on their robes, (but) the defence lawyers really control the system.... The impression you get is that you don't find tough Canadian judges. There are basic social rules, such as the "golden rule", that we live our day to day lives by, that keep us from hurting or depriving each other. The social norms, morals, and values that define what is right or wrong are lacking in these individuals. As a result, an uninformed public is increasingly falling prey to older, wiser, and technically inclined criminals seeking financial gain at little risk of legal consequences. There are a number of societal trends having a direct impact on the escalation of white collar crime. Technological advances allow for new types of crimes to be committed. Aging criminals are now committing frauds against aging victims. The perceived seriousness of fraud within the justice system is lessened as an emphasis is placed on violent crimes. Fiscal pressures on organizations and government sectors have resulted in the elimination of public fraud prevention programs. Human and financial resources of police agencies are insufficient to deal with the escalating volume of fraud-related complaints. The benefits of a common integrated database can include standardization of information capture and exchange at the detailed occurrence/records management level, aiding the efforts of all that fight fraud in the law enforcement, regulatory and criminal justice communities. The FTC has significant powers and resources to stop fraudulent practices, such as the ability to obtain injunctions and asset freezes which enable them to stop fraudulent conduct soon after they obtain evidence of it, to preserve wrongfully obtained assets, and to provide redress to as many aggrieved consumers as possible. However, while their authority exists before U.S. judges, it does not extend to foreign courts. Canadian telemarketers are aware of these jurisdictional limitations and take advantage of them. While the FTC has obtained personal jurisdiction over Canadian defendants in U.S. courts because of their transactions in the U.S., so long as defendants and their assets remain in Canada, preliminary and permanent injunctions issued by U.S. courts cannot reach them to halt their conduct. Moreover, if the FTC obtains a judgment for consumer redress, enforcement of that judgment across borders is difficult at best because asset freezes reach only property held in or controlled by someone in the United States. Accordingly, faced with a typical FTC action, Canadian defendants can often continue to operate their deceptive businesses in Canada, defrauding U.S. residents and dissipating assets. In the scenario where the Vermont Attorney General wanted to put an end to Canadian telemarketers ripping off seniors in Vermont he had to devote considerable time to a series of cases which he hope to prosecute in conjunction with the U.S. Attorney’s Office, District of Vermont. These cases represented approximately 15 Canadian telemarketing scams that used a Vermont mail receipt service and a Vermont address when defrauding customers, both in Vermont and around the country. Under the direction of an Assistant United States Attorney the FBI and United States Postal Inspection Service spent over six months gathering subpoenaed financial records related to the various scams. They are expected to take over 200 hours of prosecutor time to prepare a prosecution analysis report which will be used to further focus their investigation, the next phase of which would likely involve writing a series of Mutual Legal Assistance Treaty (MLAT) requests for searches in Canada. From there they will need to write more MLAT’s for arrest warrants and then begin the grand jury phase, and hopefully, begin the extradition process from Canada. Unfortunately, the International Affairs Office at the U. S. Department of Justice is severely backlogged with MLAT requests, to the point where they urge state investigators and prosecutors to develop and utilize all possible informal investigative channels. This usually means having contacts in other jurisdictions, or in these cases, in another country, that one can call and ask for investigative information in an informal manner that is outside the MLAT process. The only way to have contacts in Canada, though, is to work to develop them. This takes visits, time, and reciprocity. (4) Lack of funds to file asset freezes in Canada--If a telemarketer has assets, the best way to get restitution for victims is to freeze the assets before the criminal action is filed; this routinely costs from $15,000 to $40,000 in fees to Canadian attorneys. Having taken note of the overwhelming number and variety of frauds which exist, along with the also numerous departments and agencies which overlap in the administration and enforcement of even more laws, you can see how efforts to combat these crimes might get bogged down or entirely defeated. Were I to organize a concerted effort to combat this problem I would start first by setting certain standards or guidelines for action and responsibility. First off, local police should act on complaints only if they determine that the perpetrator is local in nature and is not involved in a larger out-of-area telemarketing operation. This determination should be done surreptitiously to avoid spooking a group into destroying evidence and closing down. The role of local police is enhanced by acting as support for the agency responsible for larger operations, whoever that may be. Secondly, securities regulators should concern themselves only with organizations which have properly registered with them. All unregistered organizations or individuals should be deemed fraudulent unless and until the assigned law enforcement agency wishes to assign the case over to them for strictly administrative sanction and fines. The moment that regulators perceive, through investigation or inquiry, that any operation or individual has acted in a fraudulent nature involving other than local victims, the case should be handed over to the assigned law enforcement agency. All locally-based fraud cases should be handed over to the local police for action. Consumer and commercial affairs departments should avoid getting involved in any fraud-related crimes as described in this book and should concern themselves with the administrative shortfalls of normally legitimate retail operations or borderline abuses by trades-people. No telemarketing operations, pyramid schemes or business opportunity scams will fall within their venue unless given over by the assigned law enforcement agency or it is determined that civil action or their involvement is warranted in order to secure easier conviction or restitution. All consumer complaints falling within known fraudulent boundaries shall be forwarded to the appropriate agency by any agency which receives them. One agency shall be responsible for the gathering of all complaints centrally but shall act as an administrative collection and dissemination facility only. The benefits of a common integrated database can include standardization of information capture and exchange at the detailed occurrence/records management level, aiding the efforts of those that fight fraud in the law enforcement, regulatory and criminal justice communities. Investigation and enforcement shall be handled by separate units broken down by various specialties. For instance, depending on available funding and resources, separate task forces could focus in on the distinct areas of Sweepstakes, Foreign Lotteries, Credit Card Protection, Pyramid Schemes, Business Opportunities, Work At Home Offers, Fraudulent Investments, Charitable Telefunders, Travel Clubs and Vacation Packages, Vanity Frauds, Loan Brokers and Credit Repair, How-To Manuals, Prime Bank Fraud, Home Equity and Renovation Scams, Nigerian Fraud, Business Supply Scams, etc. Under no circumstances would I set up conflicting agencies whereby one handles internet-based frauds and the other telemarketing based. Such distinction needlessly divides resources to go after the same person who is simply using both modes of advertising. There are plenty of responsibilities to go around without inter-agency rivalries or duplication of efforts. Each unit, as described, would focus in on the specific operations of which they are specialists, both nationwide and cross-border. The only exception, or addition rather, would be a special task force, made up of seasoned professionals in this field, who would head up attacks on the weak links of these operations. Each of these special task forces would be mobile and have the resources to send out advance parties of scouts to access the threat of the investigated operation, based on its size and duration of operation. They would seek to inform local police of the nature of the crime and request assistance as and when required. They would attempt to perform early forensic accounting and arrest pre-steps such as bank account information, participant identification, merchant accounts, phone records and wiretaps as required. A central focus of the investigation shall be on the eventual retrieval of victim funds along with lead lists. The full resources of this task force shall be made available during a major bust along with other supportive or commandeered enforcement agencies. State or provincial law enforcement and consumer protection agencies should have a representative on each task force although the majority of agents should be federal. The central unit ultimately responsible for all of the task forces shall be based in each nation’s capital and overseen by the Attorney General or Solicitor General but shall have limited yet reasonable representation rotationally selected from the members of the association of State/ Provincial Attorney Generals. These representatives shall make up the litigation and prosecutorial aspect of the task forces, providing legal guidance and support through all phases of arrest, conviction and retrieval of victim funds. Rather than focusing on the difficult task of victim information retrieval, which can develop into a logistical nightmare, I would focus instead on the vulnerably exposed underbelly of these operations. For example, even though they might make ten of thousands of phone calls, they probably only have twenty lines in use. And even though they charge the accounts of thousands of credit card holders they likely only have under a dozen merchant accounts. This is where the focus on education should be. Right within the unwitting support structures of these operations; the credit card companies, post offices, banks, delivery services and the classified departments of the media. Once educated, what these service providers once thought of as a normal, legitimate business may soon warrant investigation. Other examples include targeting their advertising efforts by examining e-mail offers and magazine classifieds. Do internet searches for such keywords as "mega", "get rich", "opportunity", "offshore" and other such terms which can be gleaned from past and present examples. The fact that companies exist which perpetuate these crimes through the seemingly administrative and legitimate sale of victim lists and bogus prizes should be a major cause of alarm. It is also an opportunity to zero-in on yet another weak link. Through undercover sting operations and the tracking of shipments from obvious or discovered suppliers of "space pens", "credit card protection services" and other props to the main crime, officials can move in like cruise missiles. 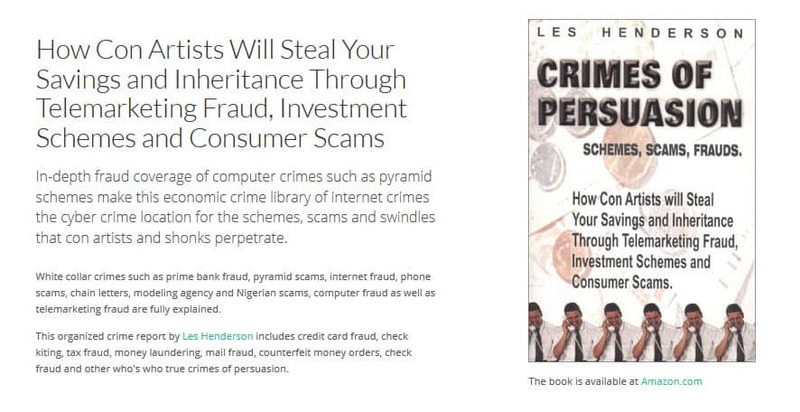 Most fraud sites focus on the crime. Mine will try to help the victim start the recovery process. I sense your frustration in the system and I share it with you for various reasons. You would think I was the scammer by the amount of help I get from the law and government here. The arduous task of developing and running a proper web site is quite daunting and expensive but rewarding all the same. I hope to eventually establish a referral system whereby attorneys such as yourself can benefit from my traffic of victims for some kind of reasonable contingency percentage fee. Any suggestions before I go broke trying to make a living on book sales? As to referrals, the State Bar of California is very strict on sharing fees. Attorneys can share fees only with other attorneys and only on the basis of the work the referring attorney actually does. Licensed attorney referral services (typically the local bar association) can also refer clients for a fee. There are many prepaid legal plans, owned by non-lawyers. You can have the referral system since you out of state. The problem is on my end. I have yet to find any site which specifically focuses on the failure of law enforcement to investigate financial crimes and the failure of the prosecutors to prosecute financial crimes. If you know of any let me know. Thought I would just mention that the only reason I have refrained from really blasting the inaction of the authorities is that I hoped they might support or buy my book. Nothing could be farther from reality. They treat me like so much dirt, not even acknowledging the donated books I send them. Worse still, unless I sensationalize a battle against them the media has no interest in the topic either. I know that they are severely hampered by certain factors so I feel for them to a certain extent but my patience is wearing thin. I agree totally. The DA represents law enforcement and his or her own financial and career interests, not the victim. We need to ally ourselves with the many victim rights movements. Years ago, John Van De Camp, a Stanford Law School classmate of mine, was on the felony complaint desk in the Los Angeles DA's office. I discussed the office's conviction rate which he said was about 58% of cases filed. At the time, the San Diego DA was touting his conviction rate of over 90%. Van De Camp replied that his office files on cases where they are reasonably sure the suspect was guilty, not just on the slam dunk cases. The S. D. DA only filed on the slam dunk cases, so I reported to Van De Camp. His reply was that the S. D. DA was letting a lot of cases go un-prosecuted which should have been prosecuted. Mr. Van De Camp later became Attorney General of California. Thus, there are different standards used by prosecutors, called "prosecutor's discretion". We need to raise the standards in most, if not all communities. We can do this by getting more competent DA's and by funding their offices with more cash to be put to good use in fighting financial crimes. Both are focuses of my web site. Media will not take an interest until there is a contest for the office of DA. We need to pick and back likely candidates. We need to have sufficient facts, well researched and rock solid, with which to defeat the incumbent DA, if he or she is not doing the job we expect. IN short, we need to be the source of good data the challenger can use. The Department of Justice (both California and Federal) keeps some crime statistics, but only of the cases actually filed. No one, it seems, keeps facts of the financial crimes not investigated, or not filed. We need to collect that information by direct means. The easiest way is to create a web site for each community which has a DA. We need to collect complete details on each case not investigated or not prosecuted. Each case should be reviewed by a competent criminal law attorney so that an informed opinion can be given to the public. We must be careful not to create libel suits against us, thus the names, places and references should be disguised. We need to get the word out as part of raising the standards of which crimes get investigated and which get prosecuted. Who is your local DA? Are there newspapers which report on financial crimes and the resulting prosecution. Do you have any trade groups or citizen groups which would be willing to support the cause? I'll help you where I can. I admire your gumption. I have a hard enough time just promoting public awareness and you want to change the entire legal system. Probably the best way to create enough momentum would be to piggyback an organization such as Crimestoppers. I haven't had much luck even getting links on their sites but I try to be patient. What you propose seems totally overwhelming to me based on the terrible government response I have had to date. Too many various agendas all restricted by budgets. I am counting on the many, very mad people, who have been ripped off, tried to get the matter investigated or prosecuted, but have been rebuffed. In time we can hope to get some subscription funding to our "newsletter", e.g., a letter we jointly create and permit all financial crime web sites to "sell" to their subscribers, of which we get a piece of the action. I am not unmindful of the magnitude of the undertaking. All great ideas start with one person. We need the multiplier effect of many like-minded persons. You are the first of many of my allies to come. You are not alone. Start by keeping "score" of the crime log commonly found in each police department or sheriff's office. Look for financial crimes and try to contact the victims. Place a small ad under "notices" in the local newspaper classifieds, giving a brief message and listing your web site. Consumer protection litigation is an area that tends to cause career burnout. I thought about applying at our AG's office, but we've recently had some tax cuts and the legislature decided that the AG Consumer Protection Department should be reduced by 38%. I just talked to an assistant AG last week and told him of a scam that I had researched. He asked me how much money they were bilking from Washington residents. $3.3 million per year. He said that's below the AG's radar screen under the current budget. Center for Problem Oriented Policing - good resource site for info on solving the underlying problems of crime.